Samoa Joe heads to the ring. He pulls a ladder out from under the ring and sets it up under the Money in the Bank briefcases hanging overhead. He grabs a briefcase before grabbing a mic. He says he will shake SmackDown to its core after he wins Money in the Bank. Tonight, he will prove to Daniel Bryan that there are things far worse than forced retirement. Joe suggests that Bryan have Brie tell their daughter that her father will not be the same when he returns home after Money in the Bank. Daniel Bryan heads to the ring, saying that he wil break Joe’s leg if he mentions his wife or his daughter again. Bryan then says they don’t have to wait until later to have their match, they can settle things right now. Before they can fight, Big Cass comes out and heads down the ramp. Cass, on crutches, says Joe and Bryan are being juvenile. He also says that Bryan’s chance at entering Money in the Bank should be Cass’s, not Bryan’s. Cass tells Bryan and Joe that their match won’t happen tonight. Instead, Joe will face Cass to decide the last entrant in Money in the Bank. Cass then swings his crutch at Bryan but hits Joe. Bryan attacks, but Cass manages to throw Bryan into the ladder. Cass then smiles and grabs the MitB briefcase. Shinsuke Nakamura practices counting to ten with flash cards. Mandy Rose and Sonya Deville approach Paige. They say being in charge must be difficult, so that’s why she’s been making so many bad decisions. Such as making Asuka a title shot. Paige tells Rose that she’ll learn why Asuka is deserving of a shot when Rose faces Asuka tonight. Renee Young then asks Paige about what Cass said earlier. Paige says Cass is cleared to compete, but Daniel Bryan did earn a chance to qualify. Therefore, tonight’s main event will be a triple threat qualifier: Cass vs Joe vs Bryan. Good match. Nakamura dominated a lot of the match, and he would start counting whenever Dillinger was down. Dillinger showed heart, getting up before ten every time and asking for more, but this was definitely a showcase for Nakamura. Nakamura didn’t have much trouble here, and he looked strong. It was a good exhibition for him heading into Money in the Bank. After the match, Nakamura hits Dillinger with Kinshasa to the back of the head. Nakamura counts and finally makes it to ten. Dasha Fuentes welcomes AJ Styles. Styles says something has snapped in Nakamura, and he’s more dangerous than ever. A last man standing match is a good choice for a strong striker like Nakamura, but Styles always fights harder than his opponent. Styles will be the last man standing. Rusev and Aiden English give Lana a pep talk. Aiden English raps and sings as he and Rusev introduce Lana. All three of them head to the ring. Naomi heads to the ring next, and she is joined by The Usos. Everyone is in the ring for a dance off, and Lana goes first. Lana is pleased with herself. Naomi goes next. She is also pleased. Lana then suggests that they dance together, so they do. They seem friendly, but Lana uses their dance as an excuse to hit a neckbreaker and attack Naomi. Lana slaps Jimmy Uso which causes a brawl. The Usos quickly eliminate Rusev and English from the ring, and Naomi hits Lana with a Rear View. Mr. Bootyworth brings a tray of pancakes to New Day. The Bar tosses pancakes at The Miz who is attempting to chop them out of the air while blindfolded. Very good match. There was a commercial break early in the match, but after that was out of the way, this got very good. After a while, Woods got a tag and created a great sequence where he was all over the ring and attacked all of his opponents. From there, the match was a series of huge moments and big moves. 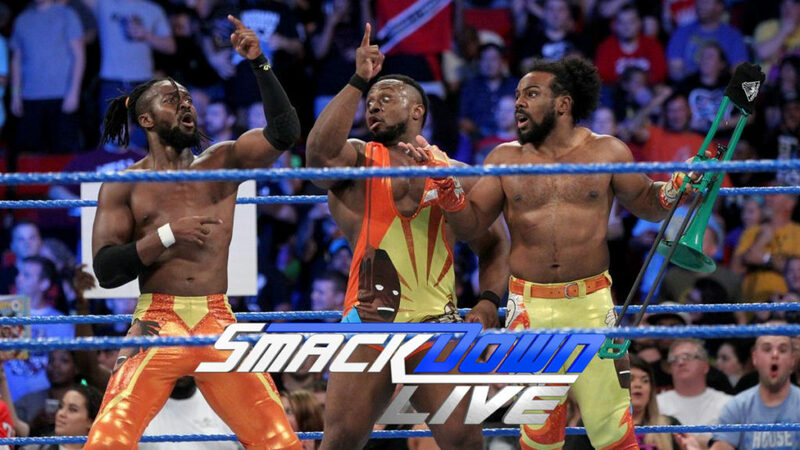 This was a lot of fun and ended up being a dominant performance from all three members of New Day. Renee Young welcomes Karl Anderson & Luke Gallows. They say they’ll do whatever it takes to take the tag titles from the Bludgeon Brothers. As they talk, Harper and Rowan appear on a monitor behind Anderson and Gallows. The Bludgeon Brothers tell the good brothers to prepare. Asuka puts on her makeup and her mask. Pretty good match. Sonya Deville attacked Asuka on her way to the ring, so this match was essentially an extended comeback for Asuka. For that, I liked it. After the match, Carmella enters the ring and holds her title up in front of Asuka. After a few seconds, Carmella moonwalks away and leaves the ring. Charlotte tells Becky Lynch that she thinks Asuka is going to win the title at Money in the Bank. That will allow her to cash in on Asuka and take her title back. Becky Lynch says nothing will stop her from getting the contract this year, not even Charlotte. Charlotte says she needs to win, so she will. Becky disagrees. Paige walks up. She likes the competitive spirit being displayed. She does the “tea time” thing Becky and Charlotte do, but Becky and Charlotte just look confused and annoyed. Paige walks away. Good match. Big Cass definitely acted like a spoiler in this match. I think everyone wanted to see Joe and Bryan go one on one, but the addition of Cass allowed both Joe and Bryan to look strong with taking anything away from each other. I’m sure we’ll see Bryan and Joe in a singles match at some point, but this was alright for what they needed to get done. Someone qualified, and the feud between Cass and Bryan was advanced and will (unfortunately) continue. After the match, Big Cass hits Daniel Bryan with a big boot. This was an okay show. Taking away the promised Bryan versus Joe match makes sense, but it’s still a little disappointing regardless of any valid reasoning. In other segments, the dance of was fine for what it was, Nakamura’s beating of Dillinger worked, Asuka defeating Rose also worked, and the six man tag was very entertaining. So yeah, kind of a mixed show. The action was big and exciting in this one. Definitely a fun match.